There is one transitional cover-up what can be worn during spring (March to the end of May) and fall (from September till the beginning of December) months and its name is coat. This outerwear piece is practical and wearable. One thing is known for sure, every coat has a huge impact to your overall outfit. They can be sleek, structured or brightly colored, so you can think over what to dress underneath. All in all, I think we better check out some of the best and trending styles to try on this year, right? Camel coat is already a timeless garment. It's an extremely classic piece what can be worn with black and white apparel. Try on a double-breasted camel style with a striped pullover and cuffed jeans. Finish the look by adding metal color shiny pumps. Speaking of classics, then there is another great style to try, and it's called double-breasted coat. This menswear-inspired cover-up will give you a mannish touch what will make you look unique and voguish. Personally, I love those double-breasted versions what are tailored to the waist and the bottom is flared - this adds a right dose of femininity. This is an ideal office style cover-up what can be worn with knee boots and beautiful tights. If you want to look ladylike and sweet, then I recommend to try on a pastel colored coat. This is a perfect way how you can accentuate your glamour style. By the way, pastels are must-have colors to try this year. I am pretty sure, every lady will look great wearing a candy hue coat. The best way how you can style this color is teaming it with monochromatic or black and white separates. 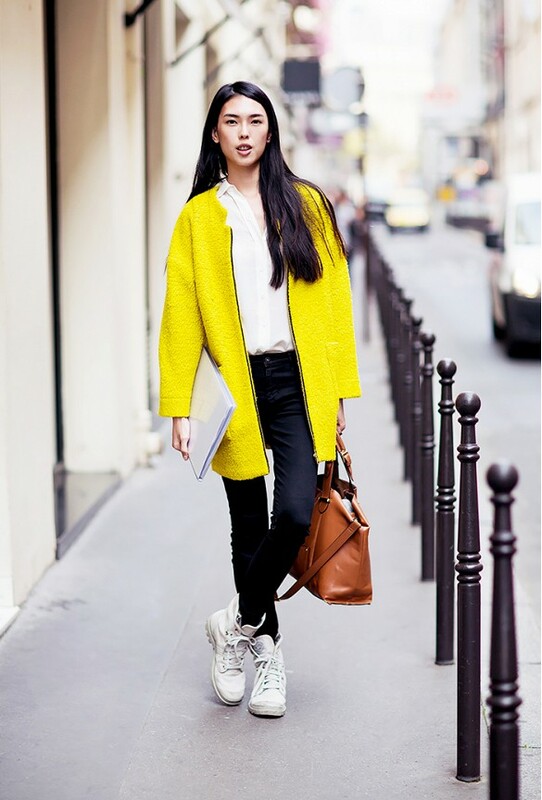 The bright color outerwear is another great choice to try this year. You can look great in a purple, yellow or green version. Try it on atop neutral colored apparel. Don't forget about accessories, as you can finish the look by adding mirrored sunglasses or classic handbag. Pale purple wrap coat looks ideal worn atop sky blue top paired with white straight-fit skirt. Robe coat is a simple and chic garment what can be worn with a belt or opened. Try it on with your favorite dressy outfits, so that you can show-off what's underneath your coat. This style will balance your tailored look by adding a sleek effect. Keep it minimalistic. The white colored coat can be tricky to style. You better wear it with bright separates, otherwise you will look like a doctor or a scientist. Keep it fun and flirty. Finish the look by adding bold patterned scarf or a glossy belt. Try on bright yellow design styled with sporty chic separates, like white shirt tucked in jeans and finished with cool lace-up combat boots. How about black coat? I recommend you to wear it to the office. The great thing about black color is that you can wear absolutely anything underneath, starting from dressy and formal wear to cocktail dresses and casual separates. Keep it ladylike and tailored. Try on chunky knit sweater underneath.